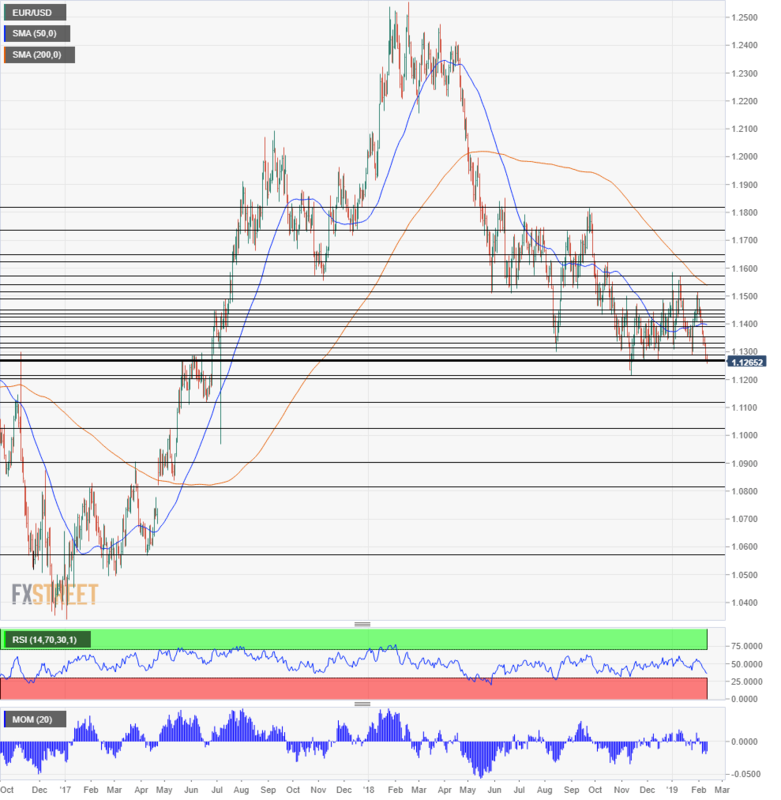 EUR/USD lost the all-important triple-bottom around 1.1270. Economic divergence is behind the move. Here are the big levels to watch on the daily chart. Euro/dollar breached a level that supported it three times. 1.1270 was hit in November, then in December, and finally in February before the pair broke to lower ground. While the move awaits a definite confirmation, the downside trend is clear. The slide in EUR/USD is also reflected in bond yields. While the 10-year US Treasuries remain stable, German bond yields are flirting with 0%. The demand for German bunds, which serve as safe-havens in the euro-zone, represents the worsening economic prospects for the currency bloc. US growth remains upbeat. What’s next for the pair? While the pair is stubborn, the break below the critical line opens the door to 1.1215, which was the lowest level recorded in 2018. A breach below 1.1215 already sends euro/dollar to levels last seen in June 2017, 20 months ago. Weak support may be found close by, at 1.1200 which is a round number. However, a considerable cushion awaits only at 1.115, that provided support before the pair surged around that period. Lower, the next support level is at 1.1025, just above the round number. It capped the pair in May 2017 and now switches to resistance. The round number of 1.09 held EUR/USD down back in March 2017 and is now support. The gap zone at 1.0820 is next. Looking up, euro/dollar has quite a few resistance lines that date back from recent days. 1.1290, 1.1315, 1.1330, and 1.1350 may all cap attempts to recover.